“Gross!” “Yuck!” “Eww!” Is this what your kids say when you tell them to eat their vegetables? If so you are not alone. The eating of vegetables is often the biggest struggle at the dinner table. It is a battle that has loomed on for years and years. And it’s not just a struggle with children. I still have to remind my husband that he needs to eat his veggies. Here are seven sure fire ways to easily increase your vegetable intake from Stealth Health. 1. Serve raw vegetables at every meal. Nearly everyone likes carrot sticks, celery sticks, cucumber slices, string beans, cherry tomatoes, and/or green pepper strips. They're healthy, they have virtually no calories, they have a satisfying crunch, and they can substantially cut your consumption of the more calorie-dense main course. So make it a practice: A plate of raw vegetables in the center of the table, no matter what the meal is. 2. Take advantage of prepared veggies. We usually don't espouse prepared foods. They're usually more expensive and high in artificial flavorings, sugars, and sodium. But when it comes to prepared veggies -- bagged salads, pre-washed spinach, peeled and diced butternut squash, washed and chopped kale -- we're all for it. Numerous consumer studies find that we're more likely to use bagged salads and other produce. In fact, the introduction of bagged, pre-washed spinach in the late 1990s is touted as the main reason spinach consumption increased 16.3 percent in the United States between 1999 and 2001. 3. Sneak vegetables into breakfast and lunch. One reason we don't get enough vegetables is that many of us consider them merely a side dish to dinner. 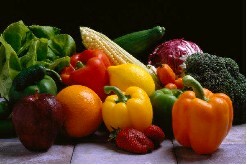 If you really want to increase your vegetable consumption, you have no choice but to eat them at other meals. How? Make egg scrambles a regular breakfast, using a scrambled egg to hold together sautéed vegetables such as peppers, mushrooms, zucchini, asparagus, or onions. Eat leftover veggies from last night's dinner with breakfast or lunch. Cherry tomatoes, cucumbers, carrots, and celery, all the time. 4. Start each dinner with a mixed green salad before you serve the main course. Not only will it help you eat more veggies, but by filling your stomach first with a nutrient-rich, low-calorie salad, there'll be just a bit less room for the higher-calorie items that follow. 5. Once a week, have an entrée salad. A salade niçoise is a good example: mixed greens, steamed green beans, boiled potatoes, sliced hard-boiled egg, and tuna drizzled with vinaigrette. Serve with crusty whole grain bread. Bon appétit! 6. Fill your spaghetti sauce with vegetables. We typically take a jar of low-sodium prepared sauce and add in string beans, peas, corn, bell peppers, mushrooms, tomatoes and more. Like it chunky? Cut them in big pieces. Don't want to know they're there? Shred or puree them with a bit of sauce in the blender, then add. 7. Order your weekly pizza with extra veggies. Instead of the same old pepperoni and onions, do your health and digestion a favor and ask for artichoke hearts, broccoli, hot peppers, and other exotic vegetables. Many pizza joints stock these days for their gourmet pies.